Airlie Beach diving liveaboard New Horizon visits Whitsundays scuba diving sites for scuba diving, snorkelling and other fun activities. New Horizon is a boat for younger guests. The vessel is included in our website because the cruise offers the opportunity for one certified or introductory dive at a suitable Whitsunday Islands dive site accompanied by a qualified scuba diving instructor. If you are a serious diver hoping for a number of dives New Horizon is probably not the cruise for you. This Airlie Beach dive trip departs from Abell Point Marina three times per week on Monday, Thursday and Saturday at 2:00 pm for a 2 day/2 night liveaboard cruise around the Whitsunday Islands. Scuba diving is an optional extra. 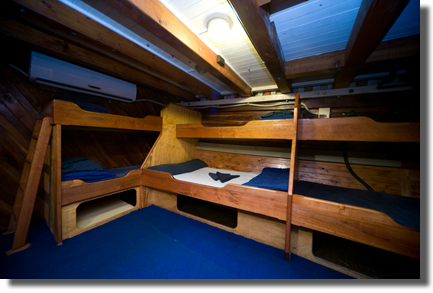 See our full Australia Liveaboard Dive Trips selection here and see Getting to Airlie Beach for transport tips. 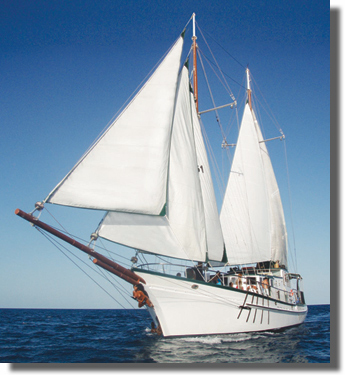 This Airlie Beach diving liveaboard is our most popular tour for the 18-35s social fun seeker market. The tour offers time to explore the islands, including time to relax at the magnificent Whitehaven Beach, walk to Hill Inlet Lookout and visit two Whitsundays snorkelling stops on the fringing coral reefs which extend right from the edge of the Islands. Scuba diving is optional and should be arranged when making your booking. The Captain and crew will provide interpretive information on the Whitsunday Islands and the Marine Park as we are an ECO Certified operator. 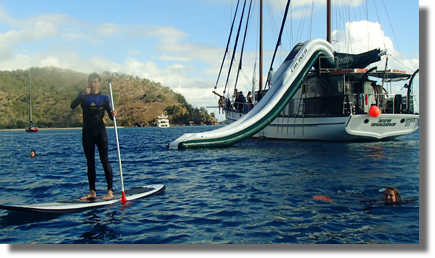 Day time ship-board activities include stand up paddle boards or sliding off our massive water slide or taking the plunge off the diving board. Of an evening the crew will join in to make an evening fun and entertainment with games, karaoke and a movie lounge. 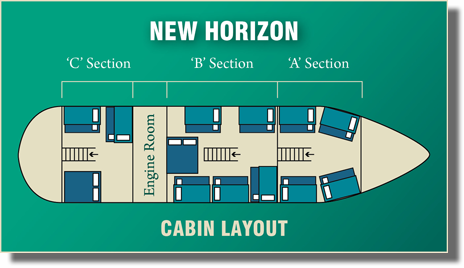 New Horizon offers plenty of space across 2 decks, and the lower deck guest cabin area is air conditioned and offers open plan accommodation consisting of single or double bunks, 2 toilets and showers. Guests should check in at the Airlie Beach Office by 11am the day of departure. During Check-in guests will complete a questionnaire to help with our on-board services. Boarding passes will be issued. Guests will meet crew at the Marina ready for boarding at 1:40pm. Guests are provided with a Soft Bag at check-in. Please pack toiletries, beach towel, cap, bathers, sunscreen, jacket/sweater, runners or sandles for island walks. Lockers for large luggage are available in Airlie Beach.